The following is an Access Statement for Lady Margaret’s, a listed Georgian Townhouse in the centre of Bath. Directions by air, road and rail can all be found at the Directions page on www.ladymargaretsbath.co.uk. 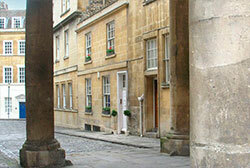 Lady Margaret’s is located in the city centre of Bath and is a level walk from attractions, restaurants and shops. Nearest local shops for provisions are two to three minutes walk away in either Julian Road (Coop) or George Street/Gay Street. There is a large Waitrose at the Podium Shopping Centre just past the Guildhall. 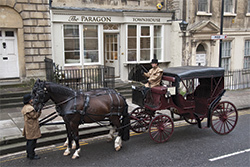 Although Bath is best reached by public transport, cars can be driven to the north end of Margaret’s Buildings for loading and unloading but should be parked according to the following to avoid ambitious Traffic Wardens (lots of them). There is one Residents Parking Permit which will be given to you on arrival if required. This can be used in all C (Central) zone areas as shown on the back of the permit. There is a car park five minutes walk away off Charlotte Street for both short stay and longer term parking (see map on website). There is a video entry phone at the front door which can be heard on all floors. The main front door entrance on Margaret’s Buildings enters the house at Ground Floor level. The visual signs on the front door include number 9 and the video entry system is to the right of the door. There is also a brass sign on the left of the door which reads ‘Lady Margaret’s’. The front door leads into a hallway and up stairs to the sitting room and kitchen/dining room. The house is arranged over a total of 3 floors – one of the bedrooms is en suite, but there are stairs from the sitting room to each of the bathrooms and bedrooms. Pets are not permitted at Lady Margaret’s. Lady Margaret’s is strictly no smoking. Public Areas – Hall, Stairs, Landing, Corridors, etc. Lady Margaret’s is an original listed Georgian Townhouse and there are no lifts or escalators – only stairs. There is a central Georgian wooden handrail on spindles running for most of the stairs. The colours in the main areas are golden carpets, white skirtings and stone coloured walls. A high chair can be booked in advance for babies. There are no provisions for pets which are not allowed. As a Georgian property, the stairs and corridors are generously wide, but become narrower as you go up to the top floor. The property is spread over 3 floors. Public Areas – Sitting Room, Lounges, Lobbies, etc. The kitchen/dining room and drawing room are all on the first floor and the other main areas are all divided by stairs. There is fully fitted carpet throughout except for bathrooms and en-suite shower room which has vinyl flooring. The fully equipped kitchen is on the 1st floor and is reached via stairs from the main entrance on the ground floor. As regards disabled access, it should be emphasised that Lady Margaret’s is a listed Georgian Townhouse arranged over 3 floors. It is also a level walk to shops, restaurants and major attractions. The additional options of the day bed and truckle bed to be found in the largest ensuite bedroom measure 6 ‘3” long by 2’ 8″ wide. Specific requests should be made to Alex on 01225 446037 or emailed in advance to enquiries@ladymargaretsbath.co.uk.